Heat oven to 450°F. Make pie crust as directed on box for One-Crust Baked Shell, using 9-inch glass pie plate. Bake 9 to 11 minutes or until light golden brown. Reduce oven temperature to 350°F. Meanwhile, in 10-inch skillet, cook beef over medium-high heat 5 to 7 minutes, stirring frequently, until thoroughly cooked. Drain well. Add pasta sauce; mix well. Heat to boiling. Reduce heat; simmer about 10 minutes or until hot. In medium bowl, beat eggs until well blended. Add Parmesan cheese and spinach; mix well. Spoon half of beef mixture into baked shell. Sprinkle with 1 cup of the mozzarella cheese and 1/4 cup of the olives. Spoon spinach mixture evenly over cheese. Top with remaining beef mixture. Bake at 350°F 25 to 35 minutes or until filling is hot. If necessary, cover edge of crust with strips of foil after 15 to 20 minutes of baking to prevent excessive browning. 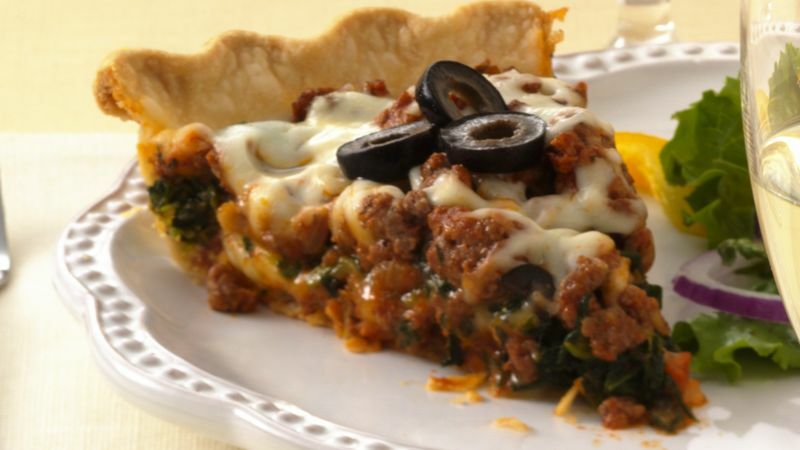 Sprinkle pie with remaining 1 cup mozzarella cheese and 1/4 cup olives. Bake 4 to 5 minutes longer or until cheese is melted. Let stand 5 minutes before serving.